I love my freezer. I know that sounds a bit odd but I don’t know how I would consistently feed my family from scratch, healthy meals without a freezer. I use the freezer to preserve fruits and vegetables, store bulk foods, and store make ahead meals for those times when I don’t have time to actually cook. Let’s chat a minute about make ahead meals. Make ahead meals can mean making a pot of soup today and serving it tomorrow, or it can mean spending a day (or weekend) cooking and freezing food to use throughout the month, or anything in between. However, it usually involves making freezer meals. 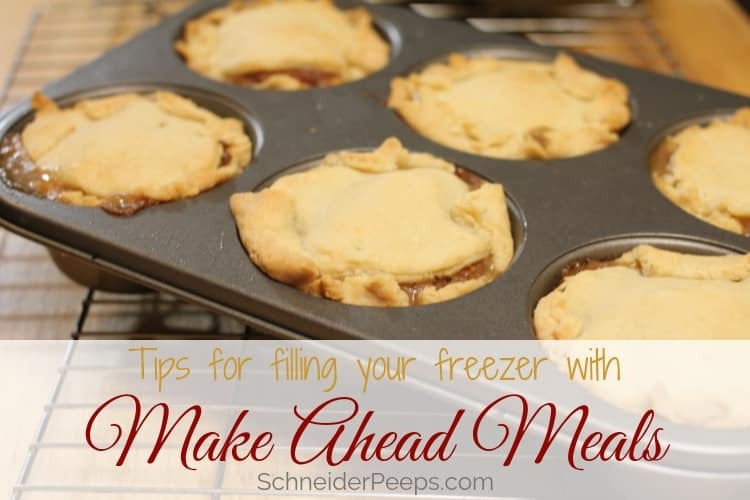 I know a lot of people who say they don’t like freezer meals and if that’s your family there are still ways you can use your freezer to help make feeding your family easier. I promise they’ll never know unless you make a big deal about it. Pretty much anything can be frozen, it’s how it tastes afterwards that’s the issue. So think about what your family likes and see if there’s a way to freeze it in such a way that they’ll still like it when it’s thawed. This might mean freezing it uncooked and cooking it when you serve it. It might mean freezing the sauce separately and adding it when you cook the meal. If your family likes enchiladas, freeze the filled and rolled corn tortillas in a pan without the sauce and cheese. You can put the sauce in another container and the grated cheese in a ziplock bag. Use masking tape and a permanent marker to label each item and write instructions on them. To cook, thaw the sauce in the microwave (or overnight in the refrigerator), pour it over the frozen enchiladas, top with the grated cheese (if it’s still frozen you should still be able to break it apart) and bake. It will probably take 25-30 minutes longer than it normally would. Pasta can also be frozen without the sauce. To thaw, boil water and add the frozen pasta. Return to a boil and stir the pasta. It will only take a minute or two for it to heat up. You can also put the pasta in a colander and pour boiling water over it. Freeze meals in serving sizes that are good for your family. If a 9×13 baking dish it too much for your family, use an 8×8 or a pyrex 6 cup storage dish. This is especially important if you’re single or have a very small family. As good as enchiladas are no one wants to have to eat them for leftovers four nights in a row. Most freezer meals taste better if they are frozen uncooked. If you absolutely have to cook a meal and then freeze it, under cook it a little. This will ensure that it doesn’t overcook when you pull it out and cook it for dinner. 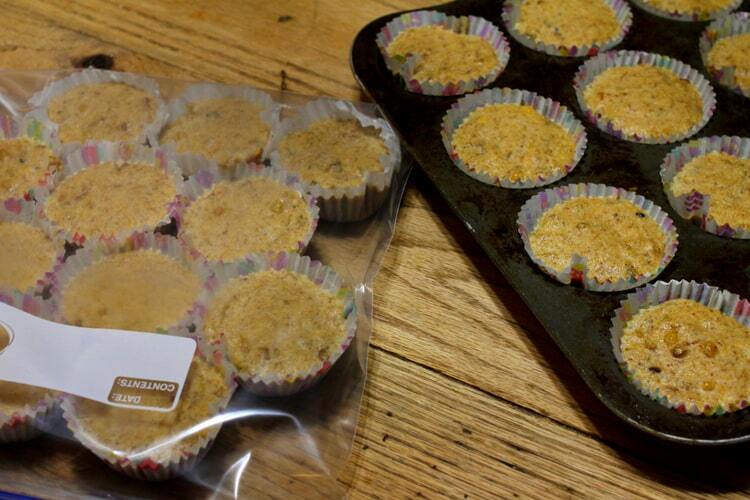 You can even freeze muffin batter so you can have fresh baked muffins in just minutes. Keep cooked meat in the freezer at all times. I have a friend who says, “If I have meat already cooked I feel like dinner is almost done.” I have to agree. It’s easy to throw together a salad to go with cooked chicken for a quick dinner. It’s also easy to make taco soup if there’s cooked ground beef in the freezer and canned beans, tomatoes, and corn in the home preserved pantry. Double up and freeze the extra. When I first learned about freezer meals it was in the context of spending a weekend making a month’s worth of meals or more. That works great for some people but it doesn’t really appeal to me. I prefer to just make a double portion of dinner one night and freeze the second portion for another night. Try a new recipe before making a bunch for the freezer. I learned this lesson the hard way. Early in my freezer cooking days I make several containers of the same meal for the freezer. The recipe came from a well known freezer book and the author said her family loved it. We did not love it. In fact, my husband who will eat anything except pickles couldn’t choke it down…and I had three more pans of it in the freezer…sigh. Whenever possible freeze meals in the same dish you’re going to cook in. I’ve found that freezing in glass baking dishes is just fine. Whenever I put a glass dish from the refrigerator or freezer into the oven, I make sure it’s a cold oven. This gives it time to slowly warm up as the oven warms up. If you aren’t comfortable doing that or don’t have many baking dishes, you can line the dish with parchment paper and freeze the meal. Once it’s frozen you can remove it from the dish as a solid block, put it in a ziplock, and put it back in the freezer. ALWAYS label what you put in the freezer. I always think I’ll remember and then I don’t. It’s made for some interesting meals, for sure, but it would be better if I knew what was in the container before cooking it. You don’t need anything fancy, masking tape and permanent markers work just fine. Write instructions and any companion food on the label. This helps keep all the family informed. If you’re running late, you can call home and ask someone to pull out a freezer meal and cook it. It also helps make sure that none of the companion food goes missing. If I label a bag of grated cheese for enchiladas my family won’t eat it but if I don’t they think it’s fair game. I’m a big proponent of freezing meals that my family already likes. These are the meals that don’t take much thought on my part because I’ve been making them for years. But I also like trying new things every once in a while. Lately, I’ve been trying recipes from the Healthy Meal Planning bundle. Slowly my family is changing. Many nights there’s only three of us at the dinner table instead of the eight that it was for so many years. My two teens that are still at home aren’t always home at night due to school and work and need to eat earlier or later than the rest of us. It’s an adjustment. I’m finding that having single serve meals in the freezer, like mini pot pies, means there’s less waste and frustration for all of us. In the meal planning bundle there’s a four week freezer meal menu plan that focuses on the main dish. The meal plan is all laid out with prep work and shopping lists. If I were using this I would make a double meal each night and then freeze the second one, which means I’d need to double the shopping list. There’s also a 72 page ebook with tried and true freezer recipes. Along with the freezer meal menu and ebook, there are many other menus and meal plans – keto, insta-pot, paleo, whole30, slow cooker, breakfasts, snacks…you name it, it’s there. Almost all the recipes are standardized to serve four. I think this is especially wonderful for singles and couples. You can make eat part now and freeze the rest for another meal, 0r meals. 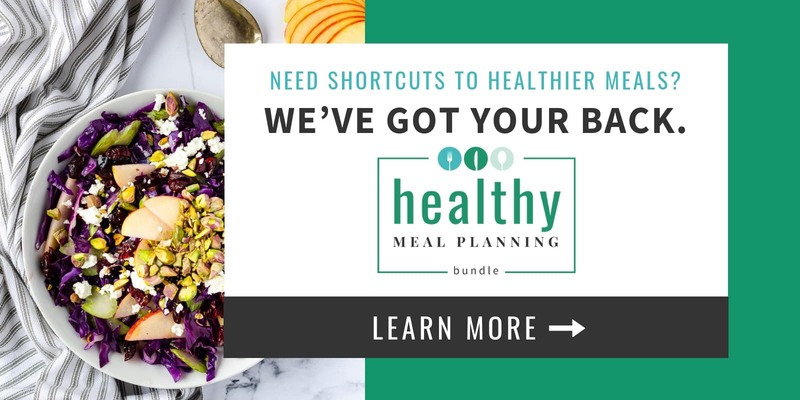 You can get more information and order your copy of the Healthy Meal Planning bundle here. While I do use my freezer for long term storage as part of my home preserved pantry, I don’t consider make ahead meals as part of my long term storage. I’ll easily freeze berries or herbs for up to a year but I like to use freezer meals within a month or so. If the freezer meals are packaged well, they can be frozen for up to four months. It’s not that they go bad, it’s that their quality diminishes the longer they’re frozen. I also don’t like the idea of food getting “lost” in the freezer so I’m pretty diligent to rotate what we have. We have a special section in our freezer that’s for family size freezer meals and another section that’s for individual freezer meals. Here’s a handy chart from the USDA for freezer and refrigerator storage times. After you decide what freezer meals you want to make, you need to decide how to package them. 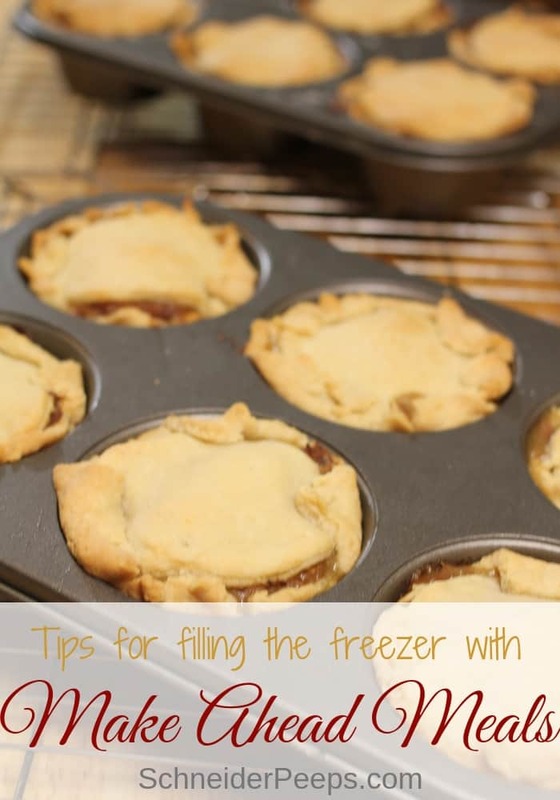 The longer you intend for them to be in the freezer, the better they need to be packaged. Air and moisture are the biggest issues for frozen meals. Every time you open the freezer it’s an opportunity for ice crystals to form inside the food container which will lead to freezer burn. If the food is only going to be in the freezer for a few weeks it’s not something to worry about, but if it’s going to be in there for several months you need to prepare it in such a way that air and moisture can’t get to it. There are a lot of options and there’s not one “right” way to prepare food for the freezer, it depends on the food and how much plastic you want in your life. You can use ziplock bags and make sure to remove all the air before zipping it shut. You can also use a Food Saver vacuum sealer if the food doesn’t have any liquid in it and it’s super fragile. I use these options for some of the things I freeze but not usually for meals. Soup can be frozen in glass mason jars. Yes, you can freeze in glass – here are some tips for successfully freezing food in glass containers. As I mentioned earlier I really like to freeze meals in glass baking dishes. I really like these with the lids – they can be pricey, but will often go on sale several times a year. You don’t have to have a bunch right away, you use parchment paper and freezer bags like I mentioned above, and not actually store the frozen food in the baking dish. If I think the food will be in the freezer for more than a month I put a layer of plastic wrap over the top of the baking dish and gently press it down onto the food before putting the lid on. This keeps the air from touching the food and helps prevent freezer burn. If it’s only going to be in the freezer for a few weeks I don’t bother with this. Goodness, this was a lot of words to say – use your freezer to prepared make ahead meals for your family so you don’t have to hit the drive through on those busy days. Do you prepare freezer meals? If so, feel free to share your tips in the comments.